We supplied 300 metres of our special trunking to the large renovation project taking place at the RAF Museum in Hendon. Cable management supports and contains cables during installation, and makes subsequent maintenance easier. Click to find out more about trunking applications. 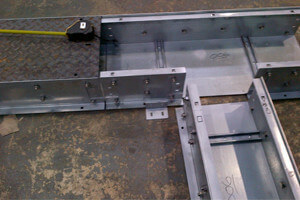 Screeduct® specialise in bespoke heavy duty trunking. Manufactured to the highest specification our trunking systems are created to nut and bolt together saving on installation time and cost. 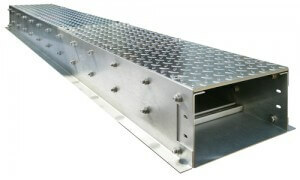 Our systems offer versatility as trunking lids are produced to be interchangeable. We’ve worked with an array of contractors, architects and chief engineers to produce the exact trunking for their projects. Our heavy duty trunking is most commonly made from galvanised or mild steel due to the inherently strong nature of this material. But they can also be manufactured from stainless steel. 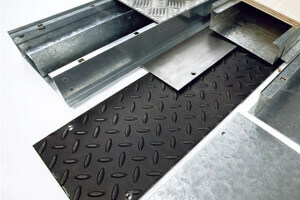 The trunking lids themselves can be produced from a range of materials including checker plate for industrial applications where a slip risk is present. Possibly the most important factor in specifying trunking is the ease of installation. As apposed to systems which need to be cut on site our alternative is delivered in sections which simply nut and bolt together. Giving, not only a bespoke perfectly fitting trunking run, but also save on installation time. Our products have been specified by an array of contractors, architects and chief engineers on some prestigious projects across the UK. Hospitals, Colleges, Railway Stations and even an RAF Museum have seen the benefits of our bespoke systems.